Preheat oven to 375°F. Line the bottom of a 9×9-inch pan with a layer of vanilla wafers. Combine sugar, flour and salt in a bowl, and mix well. Set aside. In a heavy saucepan, beat the egg yolks well. Over medium heat, add the flour mixture to the egg yolks, alternately with the milk and vanilla, stirring constantly. Bring to a gentle boil and, when the mixture begins to thicken, add the butter, continuing to stir. Keep boiling and stirring until mixture reaches a nice pudding consistency. Make sure you don’t scorch the pudding. Remove from heat. Place a layer of banana slices on top of the vanilla wafers. Pour half of the pudding over the banana layer. Put down another layer of vanilla wafers, another layer of banana slices, and cover with the remaining pudding. Beat the egg whites at high speed until they form soft peaks. Add the cream of tartar. At high speed, gradually add the sugar, a tablespoon at a time, and beat until stiff peaks form. 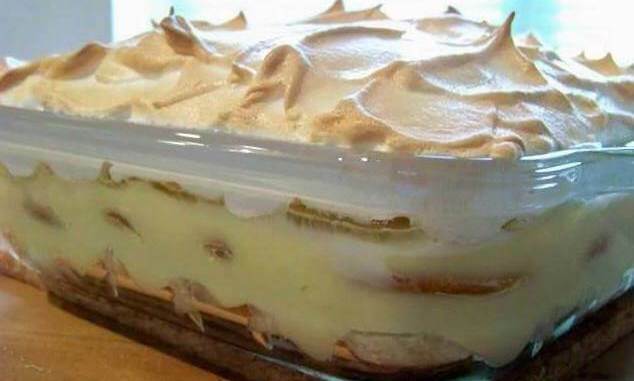 Fold the vanilla into the meringue, and spread the meringue over the pudding, sealing it at the sides of the dish.